Promoting cheap flights with the Travelstart Affiliate Program to maximize your commission earnings is now simpler than ever with our endless supply of unbranded banner creatives. 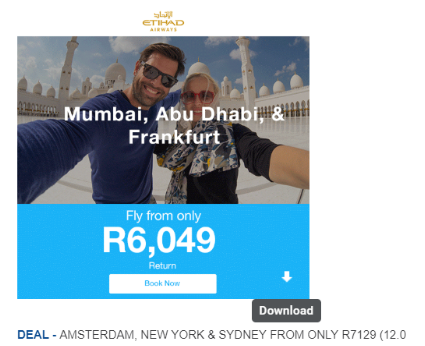 You can download promotional banners as an image or as a short code for easy uploads. 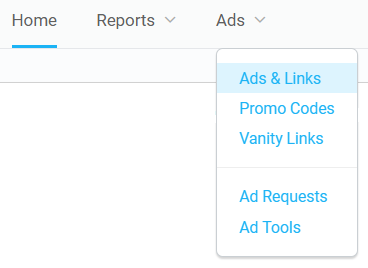 Tracking links with your unique affiliate ID are included in each banner kit you receive. The heading is the name of the sale and the banner size is on the right hand side of each heading. 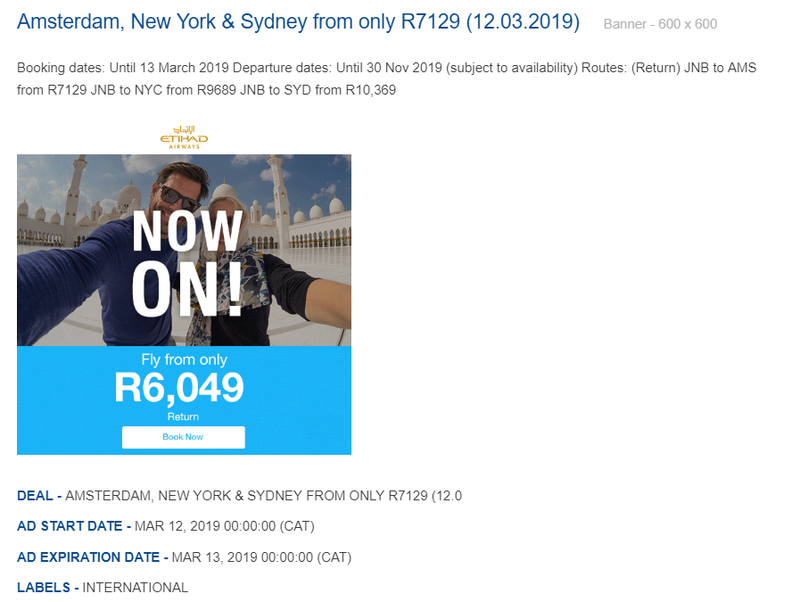 The sales booking dates (Ad Start and Expiration date), travel dates, routes and pricing is in the description above the banner image. Remember to add this information to your promotional post so your customers can find the deals. 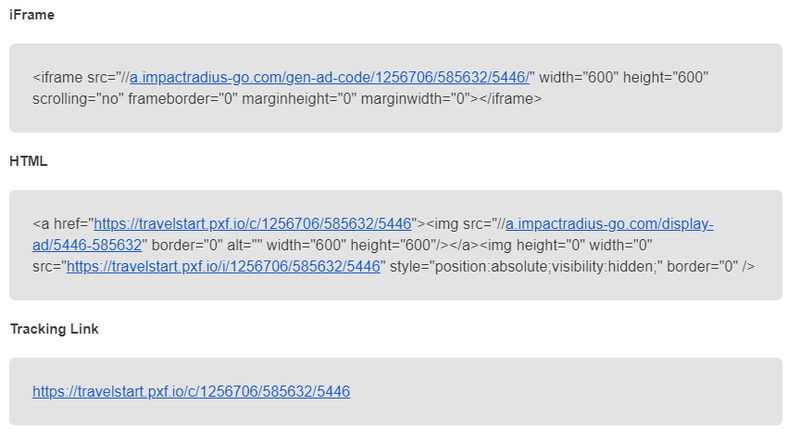 iFrame codes, HTML codes and Tracking links will be included below the banner image. 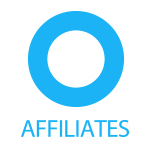 Note that your affiliate ID is already added. Click on the new “Deal” tab to show a drop-down of current deals. 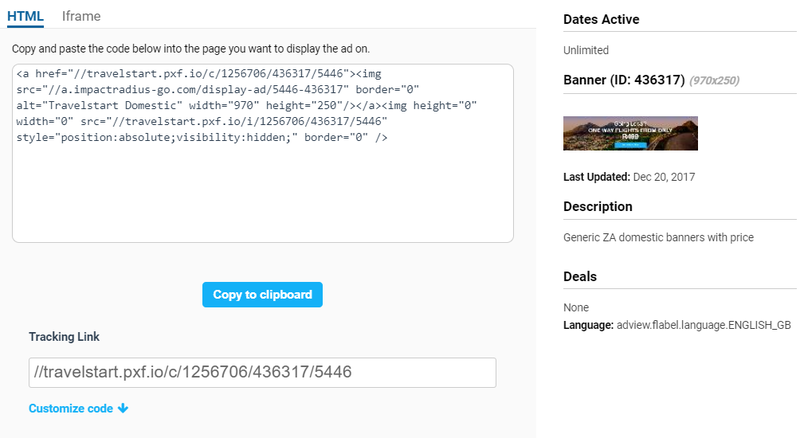 Tick the box of the deal you would like to promote to show all banners. When a sale ends, banners will automatically be removed from your account. It is the responsibility of each affiliate to remove expired adverts from their promotional platforms to keep current. Adding banners to your social media, newsletter mailer and website is the top method to drive bookings and increase your commissions. For non-iframe users, its very important to add your tracking links when redirecting to www.travelstart.com. These links ensure that sales are tracked to your account and your commissions are paid out correctly. I believe other website proprietors should take this web site as an example , very clean and excellent user genial pattern. Thank you for the great feedback firtuklo imutrzas! Copyright © Travelstart Affiliate Program All rights reserved.